In addition, the law firm handles cases involving employment law, real estate, estate planning and commercial litigation. Our law firm strongly believes in client service. We take the time to listen to our clients' concerns and thoroughly understand the legal problems they face. Then we advise and counsel them as to the best options to resolve their issues in the most advantageous, efficient and cost-effective manner. Over the years we have established a proven track record, both in the courtroom and at the negotiating table. Our clients trust us to always keep their best interests foremost in our minds and to obtain the best outcomes possible. While we believe that cooperation and amicability are always preferable, we stand ready to aggressively advocate for our clients in court when that becomes necessary. 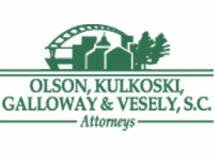 Olson, Kulkoski, Galloway & Vesely, S.C., offers free initial consultations and accepts all major credit cards for our clients' maximum convenience.